Thank you for visiting WATER SPRING online. 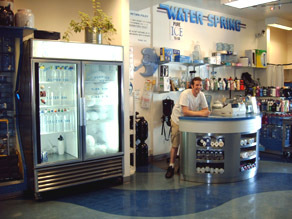 We invite you to get to know us better and then stop by our Santa Clara store for a sampling of our high quality bottled water. 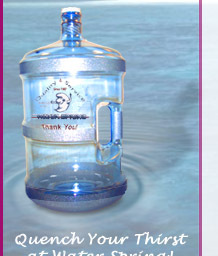 We feature PREMIUM PURIFIED, MINERALIZED and EXTRA PURIFIED-DISTILLED, as well as purified ice. Our storefront features outside vending machines that operate 24 hours/day for your convenience. Experience for yourself, first-rate customer service (we assist with your bottles, fill them and load them for you). And when you visit, check out our water processing area and see how our high technology water treatment systems deliver the best quality drinking water at a significant savings to you. We’re sure you will become one of our valued satisfied customers!